Fried pickles and peppers are a fast and easy snack to make that delights everyone when they are served. Whether you are hosting a football viewing party or a summertime happy hour, guests always want more fried pickles and peppers. The first fried pickle appeared in 1963 on the menu of Duchess Drive-In in Atkins, Arkansas, which sat across the street from a pickle factory. One day, Duchess owner Bernell “Fatman” Austin decided to throw hamburger dill chips into catfish batter, fry them up, and the rest is history. 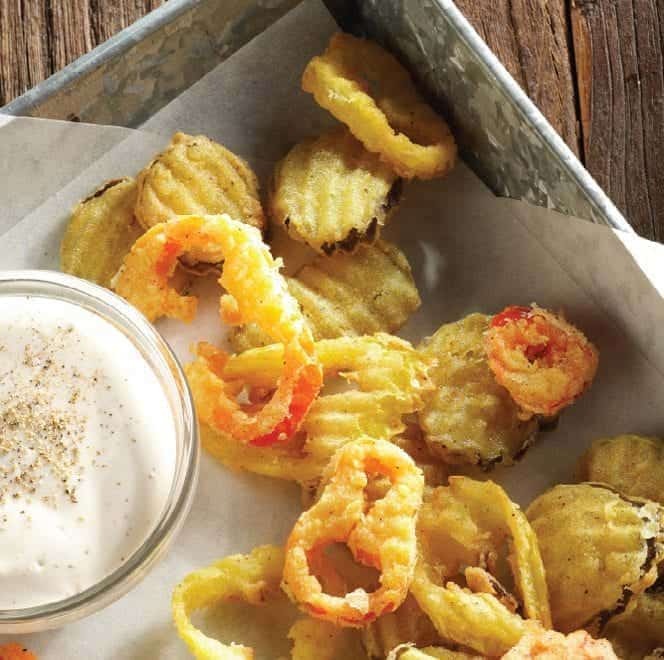 Everything about fried pickles and peppers is mouthwatering. The crispy onion ring batter coats the tangy pickles and spicy peppers for a flavor unlike anything else you’ve experienced. Mt. Olive’s savory fried pickles and peppers recipe is guaranteed to be the best snack you serve. Allow the pickles to dry off completely. After draining both the pickles and the peppers, let them dry off. By waiting for the ingredients to dry, you make it easier for the batter to stick while reducing splatter as they cook. Add more of kick. If you prefer more of a zesty flavor, sub in our jalapeno slices instead of the mild banana peppers listed in the recipe. Use a thermometer to monitor the oil. Using a thermometer when frying is a must. If you guess the wrong oil temperature, you could end up with burnt pickles and peppers. Invest in a large spoon strainer. This vital utensil makes it easier to remove your pickles and peppers from the frying oil. Keep it moving. If you want crispy pickles and peppers, continually flip them as they fry. Spicy Mayo: A blend of mayo and cayenne pepper. Sweet and Tangy: A little bit of Worcestershire, mustard, and honey. Buttermilk Ranch: A mix of mayo, chives, and garlic. For the recipe below, we used dill chip pickles, mild banana pepper rings, and hot banana pepper rings. However, any of our Mt. Olive pickles or peppers can be substituted into the recipe below. You never know what your preference is until you try, so experiment with different pickle and pepper combinations to see what makes your mouth water. Find our pickle products at your local grocery store, Target, and Walmart. Heat one inch of cooking oil in skillet or electric skillet to 360 degrees F on deep-fat thermometer. Prepare coating mix as directed on the package. Dip pickle chips or pepper rings, one at a time, into batter. Fry in oil 1-2 minutes until lightly browned on both sides. 1 Heat one inch of cooking oil in skillet or electric skillet to 360 degrees F on deep-fat thermometer. 2 Prepare coating mix as directed on the package. 3 Dip pickle chips or pepper rings, one at a time, into batter. 4 Fry in oil 1-2 minutes until lightly browned on both sides. 5 Remove with slotted spoon and drain on paper towels. 6 Serve with Ranch dressing. Not much of a recipe….#2 what coating what mix?? #3 with out saying what batter even in the video there was no batter….Batter has binder like milk or water a liquid??? David, under Ingredients the recipe recommends House-Autry brand Onion Ring Mix, or similar product, prepared as directed on the package. What! This recipe was sounding great, lots of good information and suggestions ahead of it. Then you tell me to buy some random thing for breading instead of calling for ingredients for the breading. Eye roll.